An overview on how you might present research + planning evidence. REPRESENTATION points to be added. Use the theory tag to find more posts outling terms and concepts you should seek to apply - and you should of course be using handouts from Year 10. I've included a suggested length for each section, within a range to give you flexibility. Include more of what you're strongest on. KC M Lang is crucial here and on storyboards. Not just shot type/angles, but movement; edits/transitions (eg crosscutting, crossfade, layering) + pace (short/long takes). You should try to use semiotic terms wherever possible: anchors (makes clear the preferred reading); signifies/connotes instead of shows/symbolises; achieves verisimilitude (is convincing/realistic). KC Representation is also key, especially of age and gender (but you may wish to engage with social class, sexuality, location/place etc). 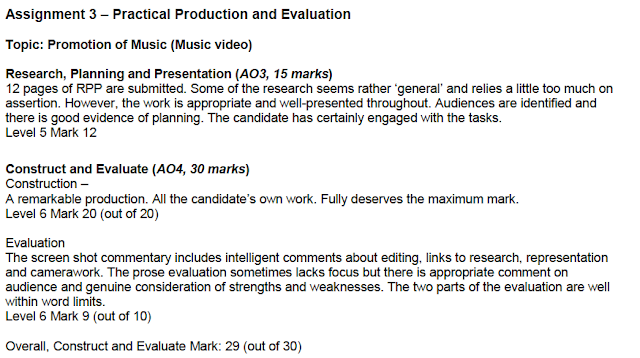 The A-grade 'Candidate B' got marked down for generalising - there was a lack of specific examples of media language from their research. A clear, specific breakdown of the narrative + role of performance. (THEORY TIP: It was Firth who argued all music videos are categorisable as 1 or more of performance, narrative, concept. Both groups are combining perf/narr). This can be as bullet points. Highlight a simple, clear statement of your primary and secondary target audiences (GAPS). A list of key influences to help make really clear the impact of your research. This is where the 'Candidate B' most impressed. Secondary research means from your reading of existing writing. An example would be points you get from articles like this [NB: contains some explicit language]. Make sure you credit the source, and make clear where you've quoted. Paraphrasing is usually better (putting into your own words, but still acknowledging the source). Industry context is specifically using data (but also any user comments you think help) from YouTube, Spotify and other social media like Facebook, Twitter. You can contextualise by including general data/figures on these, such as the payment per 1000 streams. You've got this info, you just need to format and present it! If you think your audience research points to some necessary change(s) to your initial idea and statement of target audience, BRIEFLY outline it. It is NOT a bad thing to do this. LENGTH: 3-5 pages. Work to your strengths. If you've struggled with video analysis, do more on this - or vice versa. The key here is to think of this as a substantial snapshot of your planning. You can't really present a full, detailed storyboard - BUT you can show all of these as smaller images on a single page, and then pick out some frames or scenes to highlight in a more readable scale. What you should also do is use a different colour to individually highlight the influence of your research, plus how you're setting out to target the primary/secondary audience with the choices you are showing. Likewise, a pic of fanned/spread out permission forms and call sheets, but some clearly visible detail from at least one of these. Euan asks how he would go about a bibliography. If thats a new term, it means a list of sources used within an essay, book, or evidence portfolio like yours. You have used a source if you got information from it, whether you use direct quotes or not. In that case I just inserted a useful link in square brackets; I wasn't quoting from it. This is quite useful to help evidence your 'engagement' with the task, one of the things examiners are looking for. You can list videos, sites, social media, e-zines, books, newspapers etc. Here's an example of how you might do this (probably at the end of your 12 pages). BUT, you could also simplify this by doing a grid or collage of mastheads of books, sites, mags, papers etc you used for research, stressing this represents just SOME of your research. This approach would get you as much credit as the lengthier (longer?) list approach below. This list style should not be used in formal essays by the way. A selected list of some of the sources used during my research.